There are several ways to beautify your swimming pool area —some more involved than others. For example, a few well-placed plants can improve the visual appeal of your swimming pool. You can choose to do several small beautification projects gradually or to complete one grand project after your pool installation. Here are some suggestions to take into consideration. When you’re ready to turn your pool area into an oasis, be sure to hire a full-service swimming pool company near Salt Lake City to do the job for you. An experienced pool contractor can help you with the designing, planning, and implementing processes. Water features of any kind can make a space relaxing and tranquil. The sound of moving water from a stream or a fountain is undeniably soothing. The sight of a cascading waterfall can be awe-inspiring. Whether it’s beside your pool or it’s a part of it, a water feature is sure to elevate your outdoor space. If you’re planning a swimming pool installation on your property, consider putting in a complementary hot tub or spa. Nothing quite beats the sensation of soaking in a hot tub after a nice swim in a cool pool. A well-designed pool and spa combo can be visually stunning. If you want to have a more natural looking pool area, you should use rocks and boulders. These accent pieces can be made of actual rock or a manufactured material. Natural stones can really be attractive when placed around your pool, but they can be costly to purchase and install—especially larger boulders. Artificial stones are much lighter and can be made to look like natural stones. Larger structures, such as rock waterfalls, can be fabricated in whatever shapes you desire at reasonable costs. One of the best ways to beautify your pool area is to add landscaping. Plants are pivotal in creating an oasis-like space, and they work well with natural elements like rocks and boulders. Not only can plants make an area look lovely, they can also be used to create privacy. Tall shrubs or fanning palms can block the view from a nosy neighbor or a passerby on the sidewalk. During the winter months, it is important to contact a pool contractor and perform seasonal swimming pool maintenance. When outdoor temperatures drop below freezing, your skimmer could crack if you neglect to blow out the lines. Your pool contractor can remove water from the lines so that they are protected from bursting. If you schedule this service with a highly rated pool contractor in Salt Lake City, you will not need to lower your pool water. 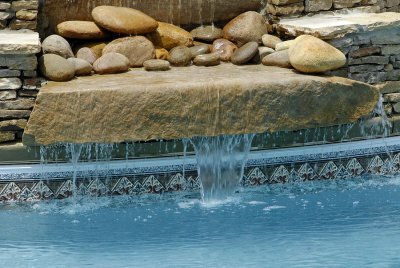 However, inground pools with tile borders should have their water lowered below the tile line to prevent damage. For a closer look at some winter maintenance tips for your swimming pool, be sure to watch this video from SwimUniversity. A pool installation will create a backyard oasis for you and your loved ones. Unfortunately, your swimming pool installation may also create the ideal conditions for unwanted pests to invade your pool space. 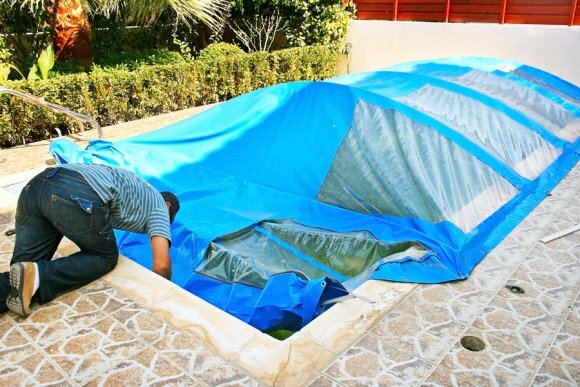 Properly installed pool covers can help keep pests away from your pool water. With the help of a swimming pool company, you can protect your pool installation near Salt Lake City . Your pool contractor can provide you with the tips and services you need to protect your pool from frogs, rodents, and other critters. Read on for more tips on how to keep pests out of your pool. In order to keep pests away from your pool, it is critical to remove any plantings or other features that may create a habitat for unwanted creatures. For example, insects and frogs may be drawn to tall grass. Additionally, plants such as bamboo and fruit trees may attract rats and other rodents. To keep mosquitoes and other insects away, you will need to remove any standing water from around your pool. If pests have become a major problem around your pool, you may want to consider installing traps around your pool area. Insects, such as flies and mosquitoes, can be removed using specialized insect traps. Rodents can also be deterred by traps, especially if they are placed near appealing food sources. A pest control company can assist you with designing and creating the perfect trap system to eliminate your pest problem. Ultimately, a barrier around your inground pool is among the best methods for keeping frogs, rodents, and other larger pests at bay. Your pool contractor can design a pool safety fence, which will physically prevent pests from entering your pool. Other materials, such as a salt and water solution, can also deter pests, without blocking off your pool area. By taking the steps needed to prevent pests now, you can ensure that your pool is not filled with unwanted invaders the next time you take a dip. A swimming pool installation is a significant investment for any homeowner. To preserve the quality and condition of your new pool installation, you will need to perform routine pool maintenance services with the help of a pool contractor in Salt Lake City. 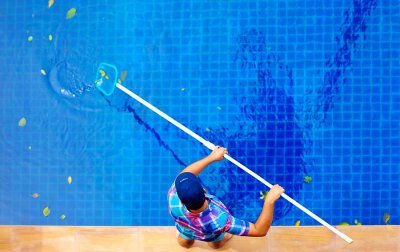 There are several signs and symptoms that can indicate that your pool is in need of a swimming pool maintenance appointment. For example, you may notice that your water level has begun to drop more rapidly than usual. In addition, the water in your chlorine pool may start to cause eye or skin irritation after you take a tip. You may also notice dirt or debris building up on your pool lighting, liner, or tile. Finally, when your pool pump begins to make loud or unusual noises, you should be sure to set up swimming pool services right away. A pool contractor in your local area will be able to fully diagnose and troubleshoot any problem that may be affecting your pool.